← Are nurses and doctors needed for earthquake relief in #Nepal right now? What would Florence Nightingale do if she were in #Nepal right now after the #earthquake? I have a suggestion for all my nursing colleagues in Kathmandu. There are evidently many places where people are living outside. I am outside the Valley, and reading everything I can get my hands on. I saw these reminders on FaceBook about using the proper toilet, washing hands etc. 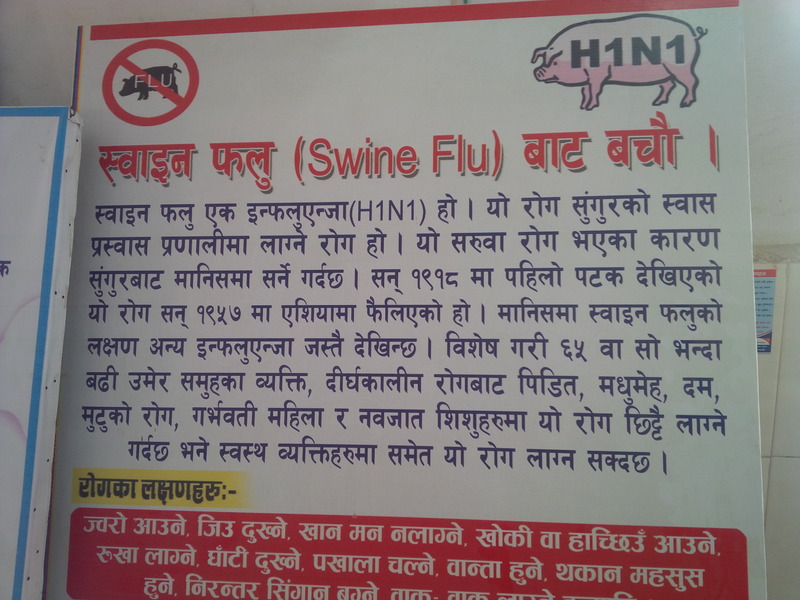 Somebody reminded that we were already having Swine Flu and we don’t want to get it out of control…..
Nepal was already having problems with Swine Flu. we can all work together to organize the people in the streets so as to prevent spread of disease. I know there are many nursing students and many unemployed nurses. The people living outside probably don’t have faceBook……..You don’t need somebody’s permission to start using your nursing skills on the people around you! I wonder if it’s possible to do the following on a voluntary basis. 2) go around and check everyone there – take b/p, find out their meds, and see if they are okay. you can screen them to decide if they need to go to doctor or health post. maybe this will help unclog the hospitals. 3) teach a class about disease prevention – just like you were still in nursing school. 4) get the children organized. I think the children especially need reminders about handwashing etc because they are the ones who don’t know the rules yet. I am not there in Kathmandu, but like the rest of the entire world, my prayers are with you. If you think this list above would work, start doing it and share this post with others. If you don’t think it would work, try something else…. This entry was posted in medical volunteer in Nepal and tagged #Nepalquake, medical volunteer in Nepal, Nepal earthquake, Nepal nurses, staff nurse job in Kathmandu, volunteer in Nepal. Bookmark the permalink. 2 Responses to What would Florence Nightingale do if she were in #Nepal right now after the #earthquake? I agree with you. many Nepalese nurses are unemployed and stay at home. I think, this is the time to show our nurses knowledge,skill and power as well as effortless dedication toward nation. This is the time for planting of nursing leadership and management skill into action for the public because this time is very critical. Nurses can play vital role to prevent and spread of diseases after disaster and promote health by initiation of simple awareness about health and hygiene. Really in this time,I am thinking in mind that you wrote on email. Small and simple devotion can bring prevent big challenges. . Please help to Nepalese nurses how to unite, how to make plan and how to put plan in to action. Thanks. I am so happy to see you email. I heartily appreciate your words. thank you for this. it needs to happen at every neighborhood with nobody in charge. I will write more on this in next blog.